You advise clients surrounding their treasury technology solutions. This could include re-defining current technology practises, vendor selection and implementation of treasury technology solutions. Zanders is a leading international consultancy firm focused on Treasury Management, Risk Management and Corporate Finance. From our offices in the Netherlands, Belgium, United Kingdom and Switzerland our consultants service corporates, financial institutions, public sector entities and NGO’s. Zanders Netherlands has established itself as a recognized specialist in treasury management. We are therefore hiring an experienced Consultant who has the ambition not only to further grow in corporate treasury and technology solutions but also contribute to the global development and recognition of Zanders. We also have positions available in Belgium and the UK. Managing treasury technology projects. Taking a leading role in decision making and coaching of junior team members. 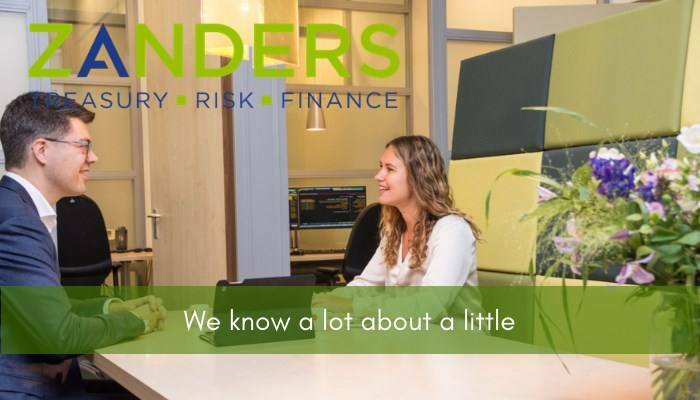 Zanders is an international specialized consultancy firm advising global organizations within treasury management, risk management and corporate finance. Our clients choose us because of our specialist and trend setting ideas surrounding financial solutions. Zanders employs over 140 people who operate from our offices in The Netherlands, Belgium, United Kingdom, United States and Switzerland. Zanders encourages its employees to share their ideas and to remain at the forefront of innovative services and solutions. We offer the possibility to specialize and develop professionally, taking on personal responsibility for client projects from an early stage. Our culture is transparent and thrives on the open exchange of ideas and knowledge between colleagues. By applying for a role at Zanders, you give us approval to use and retain your personal details. Taking into account Zanders’ nature of enterprise, you are expected to behave to a high moral standard. A Pre-Employment Screening (PES) by a third party is part of the application process. Please send your application for Senior Manager Treasury and Treasury Technology at Zanders in Bussum including your CV via our website.